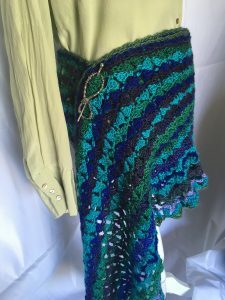 Gorgeous pictures and lacey designs are often overwhelming for me to attempt to stitch. 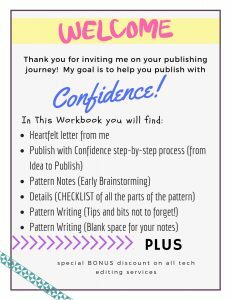 Find out how I overcame that anxiety and made several pieces from this book. This post contains affiliate links. When you use links, I receive a minor commission. This helps support my blog and free content to you and it doesn’t change your price at all. Thank you! I am not being sponsored in any way by Doris Chan or the publisher or anyone else for giving this review. This review is due to my own experiences with this book. 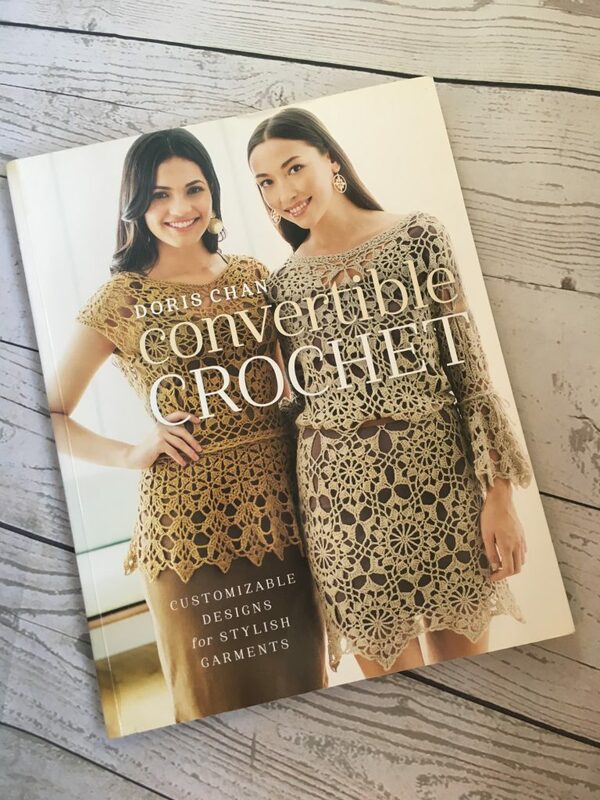 Convertible Crochet: Customizable Designs for Stylish Garments by Doris Chan is such a fun book! My husband gave this book to me for Christmas a few years ago and I have actually made several pieces. 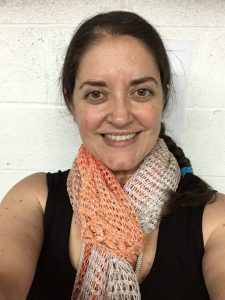 Let’s be honest, I am a crocheter, I collect patterns and yarn. 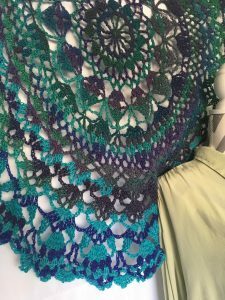 I could conceivably stop collecting yarn and patterns right now, stitch only from my stash and library and probably not run out of patterns or yarn & thread for at least 2 years. Wow, wouldn’t that be a challenge? Maybe next year. My point is that apart from flower or amigurumi books, usually when I acquire a book, I oogle and oogle the pictures and NEVER make anything. Most of the patterns I look at and think, “well, I don’t have the perfect yarn for that so I’ll wait.” Or “That’s gorgeous, but I don’t feel that adventurous right now.” Or, I might attempt one single pattern and leave the rest of the book on the shelf. 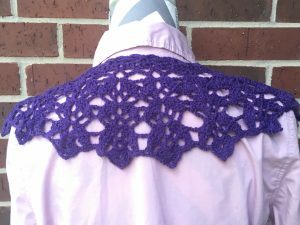 Not with Convertible Crochet, and I must credit Doris Chan for the solution to my hesitancy. 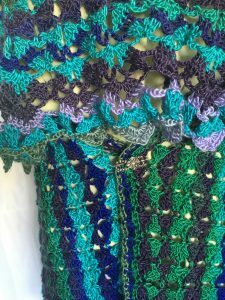 Right in the very beginning, she showed that you can do these patterns with nearly any yarn in your collection. 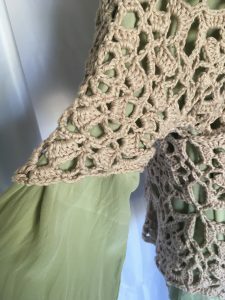 The flagship piece is called Entropy, and she shows it in worsted weight as a throw or shawl, and in thread as a doily! Hot diggity, I can do that! 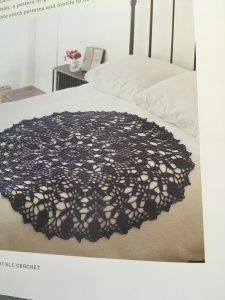 My husband got me this book because I had been doing other doily type things and he thought the designs would interest me. He’s so sweet, just melts your heart sometimes. But he was RIGHT! I love the doily intricacies. That part wasn’t what halted me from trying many of the patterns in this awesome book. It was more a matter of difficulty deciding what to do first because it ALL looked awesome. But, to be honest, there is an aspect that stops me from starting, and that is…motifs. These pieces are made of motifs that use some aspect of the patterns that are set up in the Entropy piece. She has squares, pentagons, hexagons and octagons in 3-4 different pattern schemes. 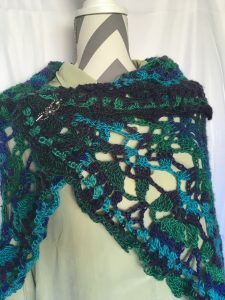 There are excellent descriptions of how to join as you go (JAYGO) when stitching the motifs and connecting them. But something about beginning a project that might take 30 or more motifs kind of halts me in my tracks. Just the thought of all that starting and stopping…ugh. It sort of rakes on my anxiety. 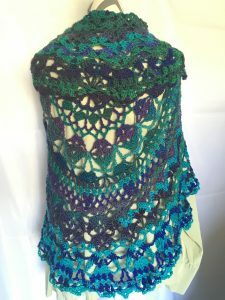 So, after I did Entropy in large (shown above) and lace weight yarn, I looked for the piece with the most approachable number of motifs. 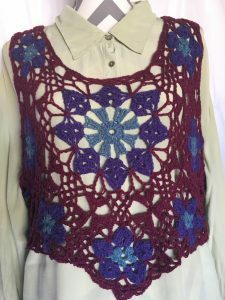 This cute cropped vest had only 16 motifs in all. First you make an octagon, then you make 7 pentagons to attach around it. I actually followed the instructions and changed colors with each round. 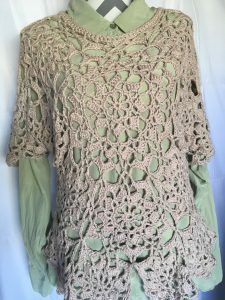 Here’s my finished piece in laceweight woollike yarn. Not all of the pieces are motif. 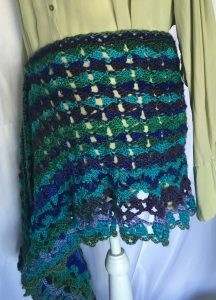 There are some that just use part of the Entropy patterns to make a skirt, collar, shawl, jacket. Here’s one that is super convertible. 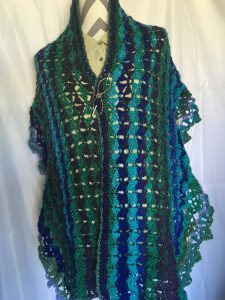 It can be a stole, shawl, wrap skirt, or pinned behind as a kind of jacket. 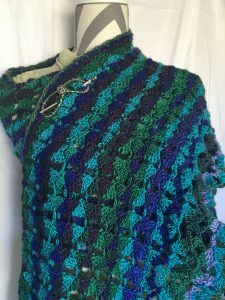 That’s also made with the Mary Maxim prism yarn from Annie’s. Isn’t it gorgeous? 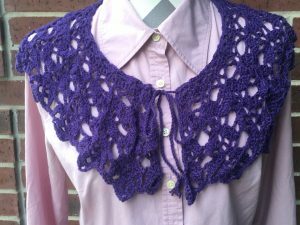 I’ve also made the collar. It can double as a belt! The most recent item I made was, I think, my most adventurous, so far. It was a complete top. I used I love that cotton yarn from Hobby Lobby. The original design was much like the vest, above. It starts with a center motif with surrounding smaller shapes. 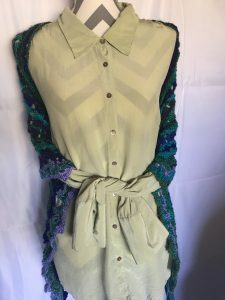 a couple motifs make the sleeves. But when I was finished, I wanted it a little bit longer. So, on my own, I made some additional squares in the same motif series as the rest of the piece and I added them to the bottom! It was so exciting. If you’re like me and the thought of making a million small pieces to fit together is daunting, please give it a chance. Doris makes these so incredibly do-able! I think the key is in the JAYGO method because with each and every piece you are adding to the whole. So you can actively see the entire piece grow quite rapidly. 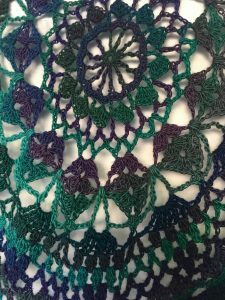 The individual motifs are not very many rounds and the attachment round adds a lot to the finished product so it will grow quicker than you expect. At least, that was my experience. 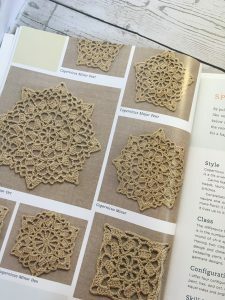 Even if you consider yourself to be a beginning crocheter, you could still work from this book. There are excellent diagrams and written instructions. I think the conjunction of having both is a great way to learn diagrams. 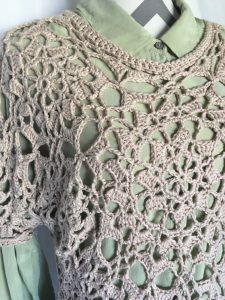 The stitches are all very basic stitches: chain, single crochet, double, treble, a bobble here and there, and some 2tog & 3tog groupings. If you can do those, you can probably do anything in this book. Isn’t that fantastic?? 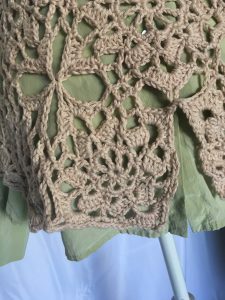 That’s what I love about crochet! 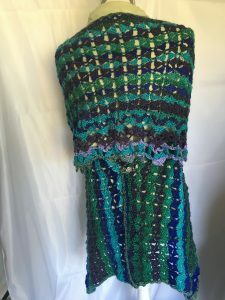 You can do the most basic of stitch, but our awesome designers, like Doris, make us look like these amazing artistic pro’s when they’re put together in creative ways. Unbelievable! 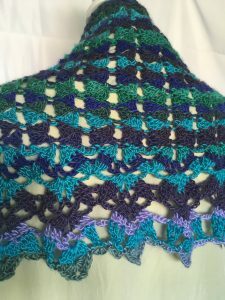 You can find more about Doris’s award winning career here at her website or her Ravelry page. Be sure to check her out after you’ve added this book to your shopping cart, or your mother’s day/father’s day/Easter/Christmas wish lists.